I wondered around my whole life. Thinking I knew exactly what my favorite dessert was. Knowing there was a song about it. (pretty sure that's about something else ENTIRELY, but didn't know any better in middle school). My very favoritest pie. Cherry. Nothing was better. It was red and sweet and tart and amazing and heavenly and it wasn't always available but when it was. BAM. Game on. Love love love. When we hopped on the real foods train, I thought I'd have to leave it for good. We don't eat processed nonsense out of a can, and the only cherry pies I had ever had were processed cherries out of a can. Do not ask me why I did not think to just buy cherries and make the filling myself. I just didn't. Leave me alone. And then, yesterday, I was happily scrolling along my instagram feed, when Shauna Niequist posted a pic of some cherry mazurkas she made. Mazurkas?? What the heck is that? And did she say cherry??? And also- WOMAN POST THE RECIPE!! 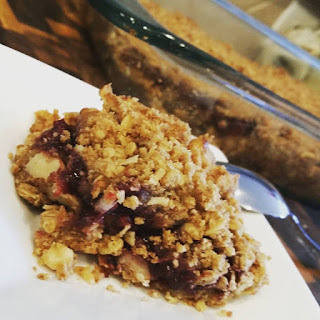 Raspberry Mazurka is one of the only recipes I could find that looked even similar to Shauna's, and another commenter posted that recipe and said she really liked that one. Shauna said that one looked better than hers and so. I got to baking. It just so happens that on a recent jaunt to Costco I grabbed a huge frozen bag of organic cherries. Pitted and everything (WOOHOO LESS WORK!). However, I didn't notice that they were sweet and not tart cherries. So I threw about half the bag in a pot with some lemon zest (because when making fruity compotey things ALWAYS ALWAYS ALWAYS add lemon zest and juice. trust me. and Carla Hall, cause that's totally her jam. literally.) And I added just a teeny bit of sugar. Make it to your taste and you can't go wrong. Put em on a low heat and let em simmer and break down, and you can help it along with a potato masher. I like a chunky jam so I don't need to smash that much. Then at the end add a little cornstarch to thicken it up a bit. (organic please- non organic corn is full of nasty). I probably could've eaten the entire pot. But I didn't. Meanwhile, get your crust together. I used the raspberry mazurka as a base recipe above but tweeked it a bit. I needed to use 1 1/2 cups of melted butter to get the consistency I wanted. And I threw in a little salt for good measure because I used raw, unsalted walnuts. I also was a leeeetle short on coconut flakes, but that didn't seem to matter because it's still perfection. And grease the pan with melted butter. Because just through away your "cooking spray". Nonsensical garbage. It made WAY too much. 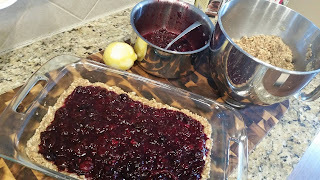 I used the size baking pan she suggested, and I STILL had enough to make a mini mazurka to freeze for sometime this fall when I'm lazy and want pie. (they say it's like a granola bar, but that's straight up nonsense. This is like the most fantastic form of a pie ever). Lay down the crust (similar to a cheesecake crust, the way you need to compact it. 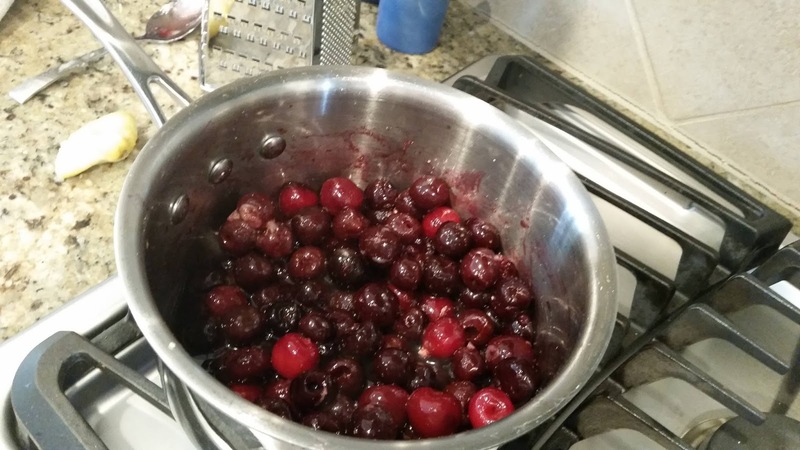 I let it ride up the edges of the pan so that the cherries didn't all dribble out the sides. Then sprinkle the layer over the top and lightly pat that. I like the top a bit crumbly so no need for compaction there. Had I not been bombarded with tiny people, this would have taken about 20 to 30 minutes to prep. Alas, that is never the case when I'm in the kitchen. And I have a tendancy to royally screw up new recipes by not reading correctly and being generally brainless, so I took my sweet time. About an hour. Then you throw it in the oven for 20 to 25 minutes at 350 degrees. And then you're supposed to wait an agonizingly long time for it to cool before you cut it. I of course did not wait. Because warm baked goods.